The amount of dross I hear/read from Republicans regarding Obama, fizzles into insignificance when I hear Obama deliver a eulogy like that. I watched the funeral yesterday. When our President an Vice President embraced while openly sobbing, it makes me proud to be a part of the party of love in this country. We need to erase the hate. The eulogy was really so moving and honestly presented about a son of the Vice President who was robbed of a great future. 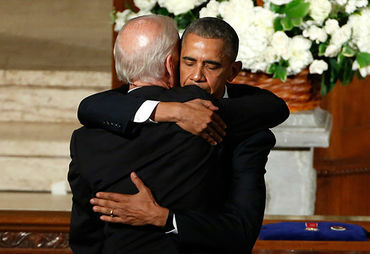 Thanks, Mr. President, and Mr. Vice President, for showing how to show compassion. Losing a child has to be one of the most devastating things to happen to a person. This man has been through hell and back, and it is obvious that his friendship with Obama is a special bond that makes them both feel the pain. A wonderful Eulogy,thanks for sharing Carrie.